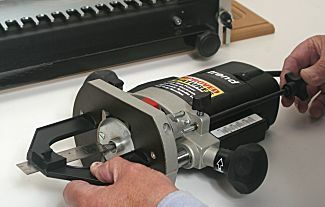 Setting the depth of cut for a router cutter or saw blade is often a bit hit-and-miss, relying on test cuts to establish exact depth, but a simple gadget is now available to help take the guess work out if it. 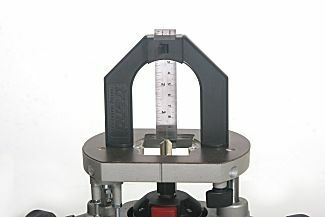 The depth gauge is basically a metal rule with metric and Imperial scales which slides in a U-shaped plastic moulding and is locked in position with a cam lever lock. When the lower edge of the rule is flush on the router table the top edge is exactly flush with the top of the U-shaped moulding. 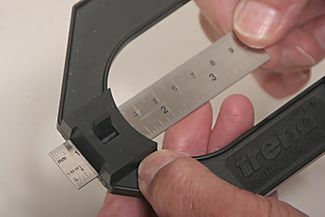 By raising the rule to the required height e.g.10mm, the gap between the bottom of the rule and the table top is also 10mm and the gauge acts as a sort of stirrup to set the cutter. 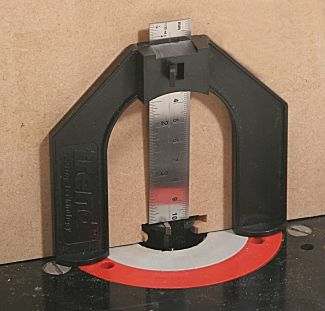 The gauge is particularly useful when setting depth of cut for dovetailing, and is made much easier if you have a fine height adjuster fitted to your router. 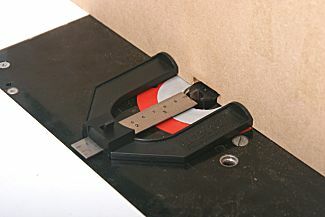 For router table work the gauge is set as above and stood on the table over the top of the cutter while the cutter is adjusted. Again, a fine height adjuster for your router is a great help. To set the table fence back from the cutter, the rule is set and locked and the gauge laid flat on the table with its feet against the fence. The cutter is rotated to the maximum projection of the blade and the fence is moved forward or back until the rule is just touching the blade. Remember that unless you are using a mitre fence the table fence can be aligned in any direction, so you can make precise adjustments by pivoting one end of the fence to bring it against the cutter. The gauge has a measurement range of 80mm and is claimed to be accurate to 0.5mm. My use of it does not contradict this accuracy. 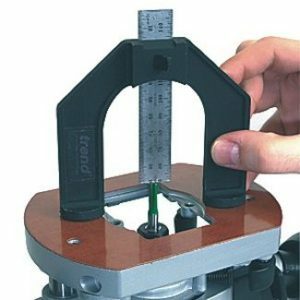 The depth gauge is likely to become one of your most-used routing work aids. It is extremely simple, which is perhaps the key to its success.